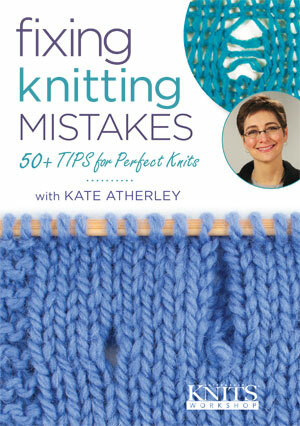 Learn 50+ ways to fix your knitting mistakes with Kate Atherley's Interweave Knits workshop. Because every knitter makes mistakes. . .
Knowing how—and when—to fix your knitting mistakes makes you a great knitter. Kate Atherley has made every knitting mistake you can imagine. Over decades of knitting, she taught herself to catch her mistakes in time and fix them easily. Now you can take her popular class on fixing mistakes anywhere and correct your knitting errors when they happen. And even corrections for errors in knitted cables and lace. Plus! You’ll also learn how to avoid many common knitting errors—and when you can leave a mistake in your knitting with no one noticing. Learn to conquer your knitting flubs and take your knitting to the next level with Fixing Knitting Mistakes with Kate Atherley. This workshop is available on DVD or as a standard or high definition video download. Order your copy today! Kate Atherley is a mathematician and refugee from the technology industry. She works as the Lead Technical Editor for Knitty magazine as well as a designer and author. She teaches regularly near her home in Ontario and at national and international events. Find more video downloads and webinars with Kate Atherley at the Knitting Daily Shop.